The variations of “yes, no, I don’t know, you figure it out” spoken by Francis on the occasion of the question of the Lutheran woman as to whether or not she could receive Holy Communion, in fact, were not the fumbling in the dark of someone who did not know what answer to give, but the exact opposite. They said what the pope wanted to happen, and is in effect happening today in the Church. The variations of yes, no, I don’t know, you figure it out spoken by Francis on that occasion, in fact, were not the fumbling in the dark of someone who did not know what answer to give, but the exact opposite. They said what the pope wanted to happen, and is in effect happening today in the Church. Pope Francis then convened in Rome a summit among the Vatican authorities responsible for doctrine and ecumenism and German representatives of the two sides in disagreement. But this summit, held on May 3, concluded at the behest of the pope with a nondecision. Or more precisely, with the order given by Francis to the German bishops to “find, in a spirit of ecclesial communion, a unanimous result if possible.” In practice, such an agreement being unthinkable, a go-ahead for all the positions in conflict. So it was foreseeable that some voice would also be raised in the United States, another country in which the large number of mixed marriages makes the controversy particularly lively. 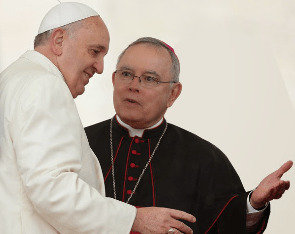 And this is what happened on May 23, with this contribution to “First Things” by the archbishop of Philadelphia, Charles J. Chaput (in the photo), he too in staunch opposition to the “Protestantization” of the Catholic Church, meaning the general tendency that many see as typical of the current pontificate and is also manifesting itself in the “downgrading” of sacraments like marriage, confession, and, of course, the Eucharist. Here is the central passage of his text, which however is worth reading in its entirety. 1. If the Eucharist truly is the sign and instrument of ecclesial unity, then if we change the conditions of communion, don’t we in fact redefine who and what the Church is? 2. Intentionally or not, the German proposal will inevitably do exactly that. It is the first stage in opening communion to all Protestants, or all baptized persons, since marriage ultimately provides no unique reason to allow communion for non-Catholics. 3. Communion presupposes common faith and creed, including supernatural faith in the real presence of Jesus Christ in the Eucharist, along with the seven sacraments recognized by the perennial tradition of the Catholic Church. By renegotiating this fact, the German proposal in effect adopts a Protestant notion of ecclesial identity. Simple baptism and a belief in Christ seem to suffice, not belief in the mystery of faith as understood by the Catholic tradition and its councils. Will the Protestant spouse need to believe in holy orders as understood by the Catholic Church, which is logically related to belief in the consecration of the bread and wine as the body and blood of Christ? Or are the German bishops suggesting that the sacrament of holy orders might not depend upon apostolic succession? In such a case, we would be confronting a much deeper error. 4. The German proposal severs the vital link between communion and sacramental confession. Presumably it does not imply that Protestant spouses must go to confession for serious sins as a prelude to communion. But this stands in contradiction to the perennial practice and express dogmatic teaching of the Catholic Church, the Council of Trent, and the modern Catechism of the Catholic Church, as well as the ordinary magisterium. It implies, in its effect, a Protestantization of the Catholic theology of the sacraments. 5. If the teaching of the Church can be ignored or renegotiated, even a teaching that has received a conciliar definition (as in this case, at Trent), then can all councils be historically relativized and renegotiated? Many modern liberal Protestants question or reject or simply ignore as historical baggage the teaching on the divinity of Christ from the Council of Nicaea. Will Protestant spouses be required to believe in the divinity of Christ? If they need to believe in the real presence of Christ in the sacrament, why would they not need to share the Catholic belief in holy orders or the sacrament of penance? If they do believe in all these things, why are they not invited to become Catholic as a means to enter into visible full communion? 6. If Protestants are invited to Catholic communion, will Catholics still be barred from Protestant communion? If so, why would they be barred? If they’re not barred, doesn’t this imply that the Catholic view on holy orders and valid Eucharistic consecration is in fact false, and if it is false, that Protestant beliefs are true? If intercommunion is not intended to imply an equivalence in the Catholic and Protestant confections of the Eucharist, then the practice of intercommunion misleads the faithful. Isn’t this a textbook case of “causing scandal”? And won’t it be seen by many as a polite form of deception or of hiding hard teachings, within the context of ecumenical discussion? Unity cannot be built on a process that systematically conceals the truth of our differences. The essence of the German intercommunion proposal is that there would be a sharing in holy communion even when there is not true Church unity. This strikes at the very heart of the truth of the sacrament of the Eucharist, because by its very nature, the Eucharist is the body of Christ. And the “body of Christ” is both the real and substantial presence of Christ under the appearances of bread and wine, and also the Church herself, the communion of believers united to Christ, the head. To receive the Eucharist is to proclaim in a solemn and public way, before God and in the Church, that one is in communion both with Jesus and with the visible community celebrating the Eucharist. 1 Response to The variations of “yes, no, I don’t know, you figure it out” spoken by Francis on the occasion of the question of the Lutheran woman as to whether or not she could receive Holy Communion, in fact, were not the fumbling in the dark of someone who did not know what answer to give, but the exact opposite. They said what the pope wanted to happen, and is in effect happening today in the Church. Francis, the man called “Pope” is not unifying. He’s destroying everybody.